I've always been fascinated by nature and the environment, but it wasn't until I moved to Brooklyn that I became interested in birds. A Red-tailed Hawk that I observed in Prospect Park was the beast that started me down that challenging road called "birding". 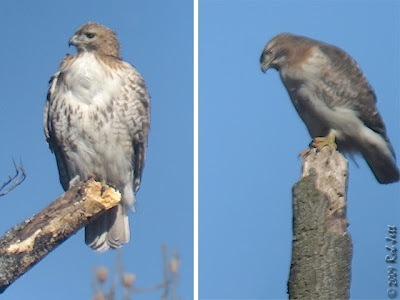 Shortly after I became aware of urban Red-tailed Hawks, I started to notice other birds of prey in my local park. Identifying them seemed like an exercise in futility as they would disappear over the hills or into the woods moments after I got them in my bins. Naively, I remember thinking, "If I could only find one perched in a tree, it would be really easy to determine the species". Fourteen years (and many misidentified raptors) later, I've learned that, in most cases, a hawk in flight is actually much easier to identify than one that is perched in a tree. Yesterday I had an experience that was a clear reminder of that lesson. I had spent several hours wrestling with a frustrating computer problem and decided I needed to clear my head. Cycling sometimes helps to give me a fresh perspective, so I hopped on my bike and pedaled to the Ridgewood Reservoir. When I got to Highland Park I rode around the bike path that surrounds the three basins. During my last lap, a hawk flew out of a small patch of woods adjacent to Highland Boulevard. It headed straight towards me, only a few feet above the pathway, then over the fence and into the forested 3rd basin. I had assumed by the general shape and brown streaks, that it was a juvenile Red-tailed Hawk. 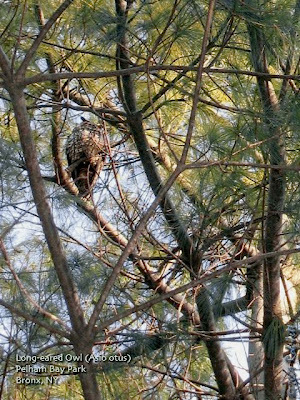 I glanced over my left shoulder and saw that it perched fairly close and it wasn't a red-tail. Rather than a belt of vertical streaks across the belly, this bird was streaked from the chin to the belly. The raptor stayed on his perch when I walked back to get a better look. The reservoir basins are approximated 40 feet below the level of the bike path. A forest growing up from the floor gives one an unusual perspective for viewing birds in the trees; almost like a canopy walkway. So, when I stuck my bins into the openings in the cyclone fence to look at the hawk, we were actually eye-to-eye. He had an usually long tail, but I was fairly certain he wasn't an accipiter. He faced me so I couldn't see the pattern on his back or wings. I started to run down in my head all the likely brown, streaky raptors; goshawk, sharp-shinned, cooper's, harrier, red-shouldered, broad-winged. I had all the time in the world to examine this hawk, but still couldn't be 100% certain of its identity. I even had enough time to shoot a short video through my binoculars. After what seemed like an eternity in birding terms, the hawk spun around and took off, down into the interior of the wet forest. For a brief second, I had the rare viewpoint of looking down on the bird's back and upper wings. He had pale panels near the ends of his wings. The habitat, alone, should have given me a hint to the bird's ID, but had he not flown, I might still be scratching my head. What do you think it is? Thursday morning Big Dave and I went into Prospect Park to check on the new hawks nesting at Nelly's Lawn. It brought back memories of 2002. I met Dave in Prospect Park during the 2002 nesting season. He was wandering around the park looking to take photos of the local hawks and was unaware of the nest. Big Mama and her mate Split-tail were breeding for the first time and picked an unlikely location; a small linden tree above the crosswalk next to the 3rd Street playground. The two Red-tailed Hawks were oblivious to the park's human activities and, over that season, I had many memorable close encounters with them and their two offspring. This new pair at the northeast corner of the park are behaving similarly unfazed by human presence. A male Merlin swooped in and perched in a beech tree at the edge of the Long Meadow, but overcast skies in the morning made decent photos nearly impossible for me. At Nelly's Lawn the male Red-tailed Hawk busily gathered branches for the nest, frequently disappearing into the trees to the north. His mate made several forays from her perch in the giant Tuliptree to the nest tree, examining the growing nursery. Big Dave and I spent an hour watching. The sun eventually broke through the cloud cover, so late in the afternoon I went back to nest with Louis Vega. We found the large, pale female perched near the top of the Tuliptree. The male was spotted a few times as he continued his search for construction materials. As Lou and I were preparing to leave, the female flew down to a tree near the Aralia Grove. Lou packed it in, but I decided to follow. Climbing the muddy hillside east of the nest tree, I found the hawk perched in a Black Cherry tree and quickly set-up my camera. I have my little Canon set to automatically take three consecutive exposures. It was late afternoon and I only had a few minutes before shadow crept over this hill. I snapped the first three photos. After I adjust my tripod, I pressed the shutter for the next set. As I did, the male flew in, mounted the female, then flew off. If I had tried a million times, I don't think I would ever been able to capture this unexpected moment intentionally. 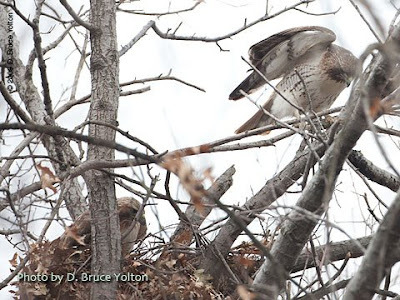 The first day of Spring is a month away, but some of the city's Red-tailed Hawks have already begun a new cycle. 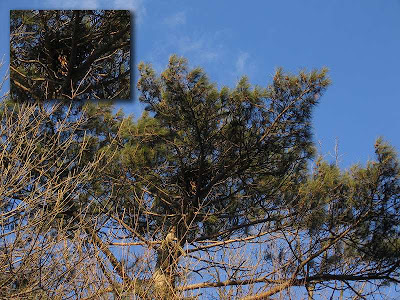 A birdwatcher, Nina Wolf emailed me the new location of the Riverside Hawk pair's nest. It is between the 95th Street exit ramp and the highway, between 93rd and 94th. On the ramp is an "Exit 20 MPH sign". The nest is west and a little south of the sign. It looks like a large squirrel's nest but the hawks have been working on it each morning. Lots of photographs on my blog. Let's hope this year is better for these hawks. For those with contacts in the neighborhood and the park, let's see if we can check on the possible use of 2nd Generation rat poisons in the park, at the Hudson Riverwalk construction site, and along buildings nearby. It would be great if these could be replaced with other rat poisons or electrocution traps. 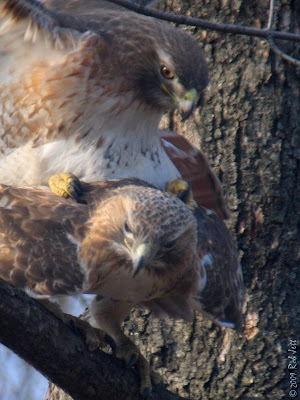 The Inwood Hill pair started brooding yesterday, so hawk breading season has begun in Manhattan! To a better 2009, than 2008. On Sunday, I cut through the park on my way to the Brooklyn Botanic Gardens. I've been very curious about the hawks building the nest at Nelly's Lawn, but haven't been able to determine if they are Ralph and Alice relocating or a new pair. Sunday wasn't helpful as I didn't see activity at either nest. I did see a huge Cooper's Hawk at the gardens and a possible owl roost near the Japanese Garden. A few week back, when looking for crossbills, I noticed a lot of whitewash beneath a pine along the celebrity path. On Sunday, there was much more, but I couldn't see any owls in the tree. Maybe it's a nighttime roost. Yesterday I went into the park again at the end of the day. Still no activity at either hawk nests. When I was walking out of the park at 5th Street, I spotted Ralph kiting over the buildings that border Prospect Park West. The wind was gusting really hard, right up the slope towards the park. Ralph had his wings pulled in close to his body, forming an "M" shape. It must have been difficult and I wondered why he was doing it, most birds were hunkered down in that kind of wind. A gentleman walking passed saw me looking up into the sky and said, "It's over there" and pointed behind me. Alice was circling above the Litchfield Villa. Was Ralph just performing for her? After a minute or two, he turned around and joined his mate above the villa, then both took off into the park's interior. I had about an hour this afternoon to check on the nests again. Starting in the Ravine, I'd focus my scope at that nest for 30 minutes, then move on to the Nelly's Lawn nest for the rest of my lunch break. Alice and Ralph never showed up at the nest that they've used for 6 consecutive years. When I was getting ready to leave, I spotted them flying off of Payne Hill and out over the Long Meadow. They circled each other over the Ravine woods for about 3 minutes. Ralph would climb high above his mate then descend with his legs down, as if he were about to land on her back, then veer off at the last second. At one point, he got close enough to lightly brush the top of Alice's tail feathers with his talons. At Nelly's Lawn I arrived just in time to see two hawks flying into the pine tree at the east edge of the meadow. I haven't found the best vantage point, yet, but the tree is right out in the open. The two raptors worked on the nest together, then one flew off towards the botanic gardens. A few minutes later the other hawk flew to a perch in the Tuliptree that overlooks the meadow. The bird seemed broad across the breast, pale headed with very dark eyes. When the second bird returned, I learned quickly who was who. 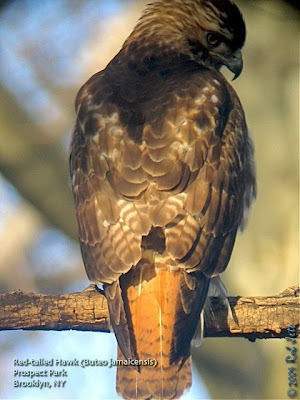 The returning hawk was smaller, very dark headed and had light brown eyes. Shortly after his return, he mounted the pale-headed female! 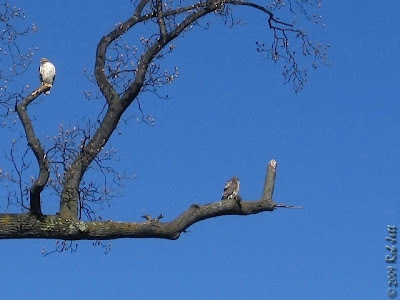 So, bottom line, there are definitely two pairs of Red-tailed Hawks in Prospect Park. I tried to take some identification photos of the Nelly's Lawn pair, but the strong wind was shaking the heck out of my tripod. Forgive the crappy quality, but you get the idea. My friend Marge has been keeping an eye on things in Green-Wood Cemetery, but has no news, yet, about Big Mama and Junior's progress. Another interesting sighting this afternoon was of a Turkey Vulture. I was walking over the Boulder Bridge and spotted a huge shadow moving along the ground. The vulture was soaring just about the treetops, heading north. This winter Floyd Bennett Field has become my destination of choice when I do a long ride. Saturday was a little chilly, but still a beautiful day for cycling and birding. It was a pretty uneventful day, bird-wise. The wind was blowing pretty hard across the grassland and the only birds not getting blown away were the fat Canada Geese. I ran into my friend, Bob O'Neill, who was driving west along the main roadway between the fields. We talked while he drove and I continued pedaling. It looked kind of silly, but I wanted to keep going until we got to the windbreak between the high, dirt berms at the Stop sign. I was heading over to the pine groves of Ecology Village and invited him to join me. The conifers around Floyd Bennett Field have been slowly succumbing to a blight and cover for owls is slowly disappearing. I rarely find overwintering Long-eared Owls or saw-whets anymore. The park service is just beginning to plant new conifers and cut down the dead ones. We were searching for white-wash and found a spot that looked promising. As we were following the splats, a large bird flushed from a roost in one of the few healthy pine trees. I got my bins on it as the bird headed towards another stand of trees. It was a tawny-colored, pale owl with a white face; something I haven't seen in that area for several years - a Barn Owl. Ironically, it was just several yards away from where I had seen my life Barn Owl. I was with my friend, Peter Dorosh. He had instructed me on how to look for owls and the first tree that looked promising, I walked over to, parted the lower branches and looked up at a sleeping Barn Owl. After Bob and I flushed the Barn Owl we walked the outer perimeter of Ecology Village, where we ran into Lenore and Starr, who joined us in the search for the owl. We never relocated it, but I recommended they check out the Cricket Field for Horned Larks. I took off on my bike, checked the bay for gulls, then met them over at the field. There were 56 larks hunkered down in the grass at the west end of the field. Despite the fairly large flock, they were easy to overlook against the dry, brown grass and dirt. The highlight of the day was across the road, at Dead Horse Bay. Historically, it has been a good spot to find overwintering scaup flocks, but numbers had gone done over the years. On Saturday, however, I observed the largest flock assembled in that location that I'd ever seen. From the dunes at the northern-most trail, there was one good sized flock to my right, in the cove near the marina. Straight ahead of me and stretching 500 yards south, to Dead Horse Point, was another immense flock. In addition to trying to differentiate the Greater from Lesser Scaup, it's a good idea to closely check these overwintering flocks because, occasionally, a Tufted Duck will be hiding among the more common birds. Unfortunately, I didn't have my scope with me, plus it was getting late in the day and I try not to ride on the streets in the dark. Maybe next weekend. Below is a list and links to some nature trips and events around NYC for the weekend of February 28 - March 1, 2009. "Established in 1910, the 52-acre Brooklyn Botanic Garden offers tranquility and respite from outside noise. It was a very frequent birding ground for club members from our early days, still so today. 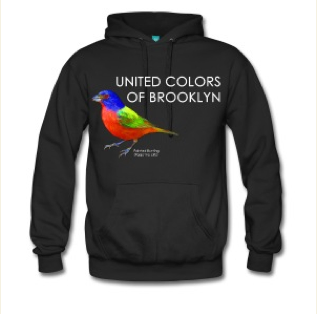 This trip will profile the garden being a part of the Brooklyn Birding experience. We will lunch at the Terrace Café inside the Conservatory around noon and continue the casual tour afterwards." Meet 10 am at the Eastern Parkway entrance of the Garden. Saturdays 10-12 is free. In the past, I've described bird surveys, such as, the annual "Christmas Bird Count" or the "Spring Birdathon". In recent years, another annual "Citizen Science" project has taken hold, thanks to the dedicated folks at the Audubon Society and Cornell Lab or Ornithology. "The Great Backyard Bird Count is an annual four-day event that engages bird watchers of all ages in counting birds to create a real-time snapshot of where the birds are across the continent. Anyone can participate, from beginning bird watchers to experts. It takes as little as 15 minutes on one day, or you can count for as long as you like each day of the event. It’s free, fun, and easy—and it helps the birds." My backyard consists of a concrete surface at the intersection of four brick buildings. While I have seen a few unexpected bird species outside the kitchen window (usually hawks), Prospect Park has become my surrogate yard. I didn't think that a 426 acre urban park qualified as a backyard, so didn't participate. Maybe next year. Click here if you'd like to see the Brooklyn totals as of this morning. To see a list of participating states, click here. I went into Prospect Park at the end of the day to look for the hawk nest. There was about an hour of amber, winter sun left tonight, when I decided to run into the park to look for some Snowdrops. 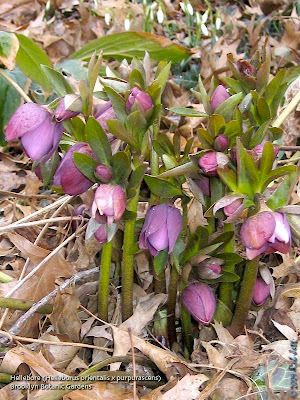 They are one of the first bulbs to flower in the late-winter and a sure sign that Spring is coming. 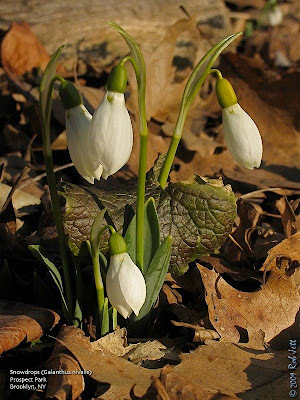 I found a large patch of the white flowers emerging on the hillside east of Nelly's Lawn. I knelt down and put my head to the ground for an ant's-eye view. The down-turned buds lining a path through the leaf litter looked like Lilliputian lampposts. I tip-toed around the carpet of blooms, making sure not to crush any while looking for the perfect lighting. There used to be another early blooming flower in that spot, Scilla siberica, but I couldn't find any of the blue blossoms. 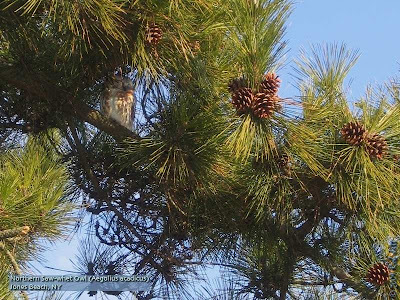 When I finished I began scanning the pines nearby, for signs of a hawk nest. Ironically, it turned out that I was crouched down, taking photos, right beneath the nest. The Red-tailed Hawks must have been working on that nest for a while because it was already quite large. I included a cropped inset in the photo, so you can get an idea of the size. Red-tailed Hawks will sometimes commence work on a nest only to abandon it and build another one in a different location. We should know within the next week or two if this is the final nest. Below is a list and links to some nature trips and events around NYC for the weekend of February 21-22, 2009. If your organization has any nature trips or events coming up and would like them posted here, just place the information in a comment window. In partnership with Volunteers for Wildlife. 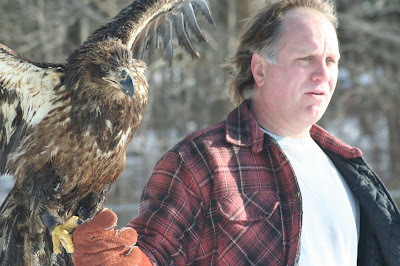 Learn about the hawks, owls, and falcons that live right in your own backyard! Join us at the Arsenal in Central Park (64th Street and 5th Avenue) for a live raptor program with Volunteers for Wildlife, where you’ll get to meet these amazing birds up close! Limited to 20 children. Attention hardy New Yorkers! Take an exciting winter cruise around New York Harbor to discover some of the amazing wildlife that can be found here only in the colder months. We will explore the waterways and shores of New York Harbor in search of gulls, ducks (such as mergansers & scaup), geese, loons (common and red-throated), grebes, cormorants (double-crested and great), and even harbor seals. Our craft will be a NY Water Taxi, which provides both an outdoor deck and a luxurious heated cabin. Hot drinks will also be provided. Meet at South Street Seaport. Come equipped with binoculars, warm winter clothing, and a sense of adventure. Limited to 45. To register, call New York Water Taxi at 212.742.1969 or visit their website. A couple of days above freezing temperatures has opened a large hole in the ice at the Sylvan Waters. An amazing diversity of waterfowl has appeared in Green-Wood Cemetery's largest pond. 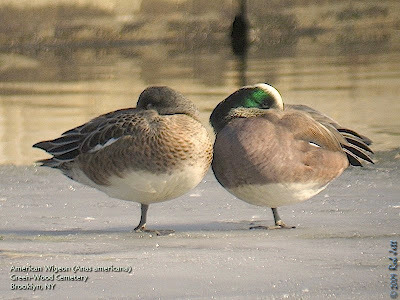 What had been dominated by Mallards and Canada Goose was now bustling with 10 species of water birds; Snow Goose, Canada Goose, Eurasian Wigeon, American Wigeon (74), American Black Duck, Mallard, Northern Shoveler, Ring-necked Duck, Hooded Merganser and Pied-billed Grebe. 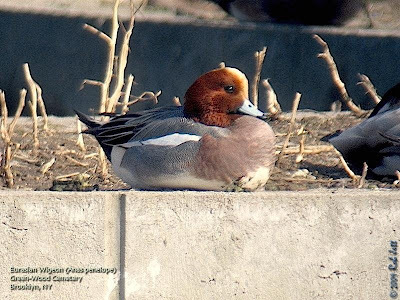 One nice surprise was the appearance of a Eurasian Wigeon. The brightly colored duck was sleeping on the man-made island in the center of the pond. Also surprising was the abundance of American Wigeons; 74 total. The irresistible pull of longer daylight hours and a distant beckoning call of Springtime had two birds hypnotized. A male Hooded Merganser and Ring-necked Duck were performing courtship displays to nobody in particular, especially since there were no other individuals of their species present. 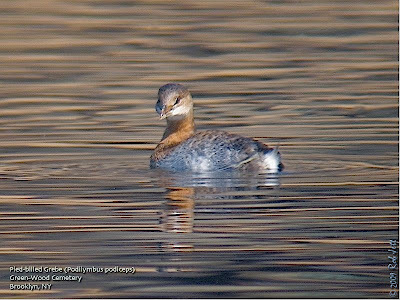 The lonely Pied-billed Grebe who overwintered in the tiny pond has yet to develop the dark chin and ringed bill of a breeding grebe. If he sticks around, it will be interesting to compare the photos as his plumage changes. I received an email regarding a pair of Red-tailed Hawks that appeared to be building a nest at Nelly's Lawn. This is the time of year when we see increased courtship activity and nest building by the local Red-tailed Hawks, so I thought I should go check it out. The email explained that the two hawks were in the huge Tuliptree at the north end of Nelly's Lawn. The male hawk was observed carrying a large branch across the meadow and into the tree. I couldn't tell from the photo if it was Ralph and Alice (from the Ravine nest) or a new pair of Red-tailed Hawks. I only had a little time at the end of the day on Monday, so made a quick run up to the north end of the park. The Tuliptree on Nelly's Lawn is a massive, old hardwood and a favorite perch for hawks. I imagine that if a pair did decide to nest in it, there would be a lot of confrontations with other raptors. Fortunately, there didn't seem to be any signs of new nest construction, so I walked the short distance to the Vale of Cashmere. I scanned the sweetgums, beeches and other deciduous trees surrounding the pond, but didn't find any nests. 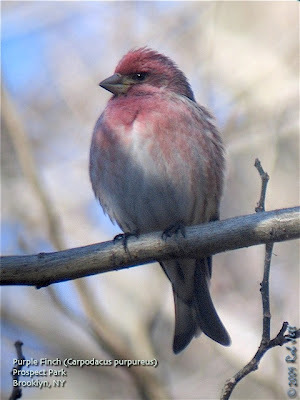 There was a small flock of Purple Finches feeding on the ground. One of the male birds has already begun a pre-Spring serenade for the females. With no hawks or nests in sight, I decided to head back home. As I passed Rick's Place, I spotted a small Red-tailed Hawk up ahead. He was perched directly above the path near the Boulder Bridge. The bird seemed unfazed by my presence and nearly tame. He had several rows of dark tail bands; remnants of juvenile plumage. That might indicate that he is coming into his second year. The hawk was scanning the ground for prey when he spotted something on the north side of the Boulder Bridge and took off in a steep dive. I ran over to see if he was successful. Three men were standing on the bridge talking and the hawk flew within a foot of one guy's head. The hawk just missed catching a squirrel, which scampered up the opposite side of the tree. Flying back towards us, the hawk came to rest on a very low branch. He was completely indifferent to the four people watching and perched only about 6 feet away and at eye level. The Ravine has been the nest woods for Ralph and Alice for 6 years. I was surprised that this "new" hawk was hunting here with such impunity. On my way through the Ravine I checked on the pine tree nest. There didn't appear to be any new material, yet. This past Saturday I went back to Nelly's Lawn and the Vale of Cashmere looking for hawk nests. I ran into my friend, Nancy, at the vale. While we were talking I spotted a Red-tailed Hawk landing in the Tuliptree on Nelly's Lawn. Scanning through the branches I spotted a second hawk perched next to him. The male hawk snapped a branch from the Tuliptree and flew circles in front of the object of his affection. The branch was still decorated with many, dried tulip blossoms and gave the impression of a Valentine's bouquet. 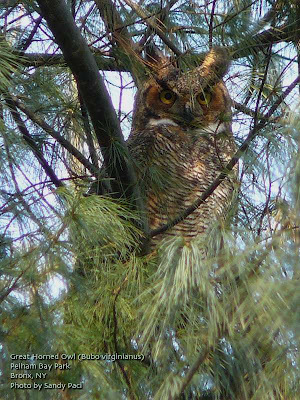 He then came to rest in a pine tree opposite her. She didn't move, but just sat in the Tuliptree, facing her potential mate. He flew back to her and they sat face-to-face for several minutes. When the male took of flying towards Mt. Prospect Park, she followed. I continued my winter theme of owls with a trip to Jones Beach last Sunday. It seems like, throughout most of human history, we have had a fascination with owls. Owl symbols, folklore and mythology go back thousands of years. From Aboriginal pictographs to Internet blogs, owl tale's have kept up with our evolving forms of communication. In New York, during the months of short days and long nights, birders don their winter gear in search of these curious creatures. At Jones Beach on Sunday there were more people than I'd ever seen on a winter day. They were wandering the beaches and median strips, hoping to catch a glimpse of an owl or two. A tiny Northern Saw-whet Owl tried to blend in with the pine cones as he slept on a perch within a conifer. 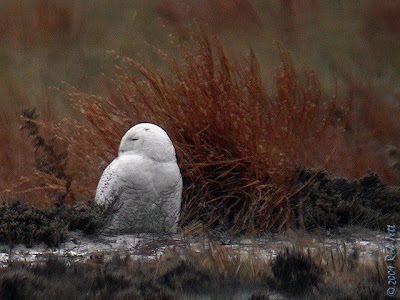 A pair of Snowy Owls attempted to remain inconspicuous within an 8 mile stretch of dunes; difficult to do (if not impossible) when one is bright white, stands 2 feet tall and there are 60 people hunting for you. Civilizations have always had a love-hate relationship with owls. Worldwide myths about these birds fall into two categories; they are magically evil or they are magically good. They have been damned as the helper to wizards, witches and sorcerers, as well as, the protectors of women, children and soldiers. Seeing an owl means a good harvest to some and bad luck to others. Owl's eyes feature prominently in mythologies. Medicines, potions and amulets made with their eyes cure seizures, act as a truth serum, allow one to see in the dark or avert the evil eye. Polish folklore says that owls don't come out during the day because they are too beautiful. They would be mobbed by other, jealous birds. Why owls? What is the allure? Most of the world's owls are nocturnal creatures. Until the invention of electric lights, human activities have been, for the most part, diurnal. 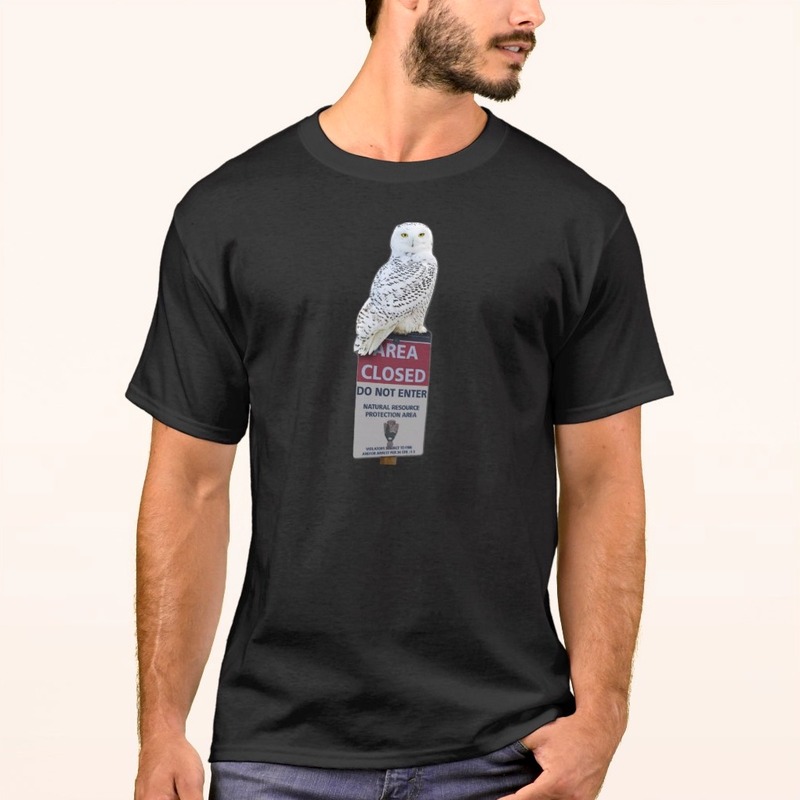 Shrouded in darkness, our inability to view, let alone understand, the life of owls had paved the way for these myths. Despite our "modern" comprehension of wildlife, some people still fear owls. It may have something to do with their eyes. If one is lucky enough to happen on an awakened owl, their eyes stare back at us with an intensity that, for some, can be unnerving. When I look at an owl, they don't seem to be observing me as a whole, so much as, staring directly into and through my eyes. 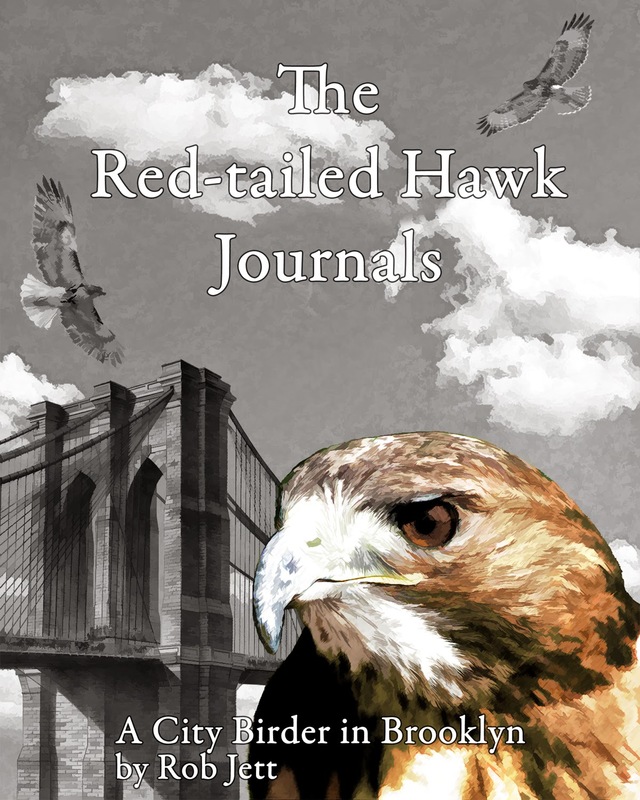 I've spend uncountable hours watching Brooklyn's Red-tailed Hawks and their offspring. There have been times when I've felt as though these animals know me and have accepted my presence. It may sound silly, but I sometimes feel as though I know them. I think it would be impossible for me to have the same type of relationship with an owl. Saturday's trip up to the Bronx was almost canceled due to a lack of transportation. Fortunately, Barbara DiPietro came through at the last moment. Thanks Barbara. Pelham Bay Park is over 2700 acres, so walking throughout the park (even for me) is a bit too much. 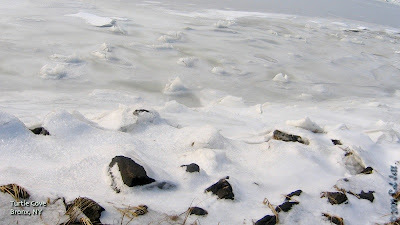 I may check it out on bicycle in a week or two, when all the ice has melted. 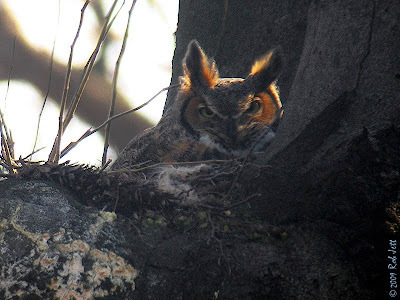 Posting directions to owl roosts on the Internet is considered improper birding ethics, but most birders from New York City know that Pelham Bay Park is the best place to look for owls in the winter. 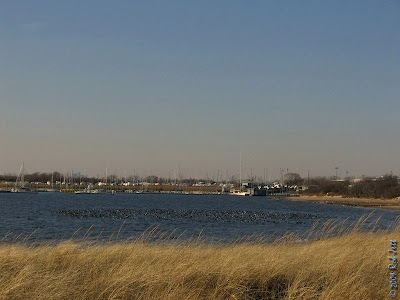 That said, owls were our main objective, but the waters around Pelham Bay are also great for overwintering waterfowl, plus other raptor species can be found in the park's varied habitats. The best way to find owls is not to look for the birds, but rather their signs. Most owls find a preferred daytime roost under which can be found what is politely referred to as "white wash". I suppose few people would want to admit that they are walking around, searching the ground for bird crap. In addition, owls swallow their prey whole, then regurgitate the undigestable bits, such as bones and fur, in small pellets. So, rather than scanning the trees for a roosting owl, the experienced owler will look for wash and pellets. Owls can blend in with the textures and colors of a pine tree so well that I've had many experiences when I was certain one was perched somewhere above me, but was unable to find it. In fact, more often than not, a birder can spend hours identifying an owl's previous meals, but never find the actual diner. Such was not the case on Saturday. Within 15 minutes of beginning our search, Lenore motioned to our group and pointed up into a pine tree. A Long-eared Owl was hunkered down in the cold, wintry air, eyes closed. His roost seemed strategically placed within a tangle of spiny branches and chosen to make photographing him nearly impossible. We left him alone after a few minutes and continued along the snow covered trails to find a Great Horned Owl. Within about 30 seconds, I turned around to make sure that everyone was following me. I saw Lenore standing beneath a dense hemlock when I caught the glint of two golden eyes. It was a Great Horned Owl. This was the easiest two owls that I've ever seen. I gestured to the group and everyone quietly walked over for views of this magnificent animal. When I say "quietly", I should point out that this is a relative term. On Saturday morning the temperature was below freezing. The snow was extremely dry and fluffy, so each step sounded like we had chunks of styrofoam strapped to our feet. The Great Horned Owl's sensitive ears couldn't tolerate all our squeaky feet and flew off after only a couple of minutes. We checked on last year's owl nest, but it appeared to be unoccupied. Whether or not that means they are nesting this year is unclear. When scanning the waterfowl in Pelham Bay we found a small flock of Common Goldeneyes. The male goldeneyes have commenced their annual courtship displays. I am completely unqualified to judge any form of dance, and I know they mean serious business, but watching these ducks perform always makes me laugh. Just describing how the males swivel their head, elongate their necks, then snap the head back onto their mantle doesn't do justice to their ballet moves, so I tracked down this video from the Cornell Library website. "Wild Turkeys are approximately as tough as Bengal Tigers. No kidding. They are the ultimate urban survivors. In Manhattan alone there are/have been Turkeys in Inwood, Central, Riverside, and BATTERY Parks. No joke. Once they make it on their own, they will carve out territories and woe betide anything short of a wolverine that dares to cross them. They intimidate coyotes. Of all my favorite urban turkey images none so far has topped that of the one in full flight (sic!) early one morning going east on 79th Street on its way from Riverside to Central. I have not yet sorted out in my mind whether they will storm across one of the East River bridges on foot, or simply fly." It is no wonder that Benjamin Franklin argued that they be made our national symbol. While scanning the ground beneath the pines I noticed a narrow trail in the snow that wound through the forest and towards a depression near the edge of the trees. I heard the snapping of twigs. Probably deer, I thought aloud. 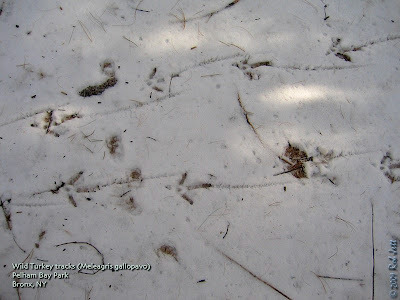 We followed the perfectly aligned tracks the animals had made and flushed a group of five White-tailed Deer. For anyone who has spent time in or around rural areas, seeing deer isn't the least bit unusual. I've probably seen thousands of deer in Upstate New York or on Long Island. To be able to find them within the boundaries of New York City! Who would have imagined? It was a first for me. Stranger still was that they were foraging in an area really close to the NYPD's firing range. The constant sound of distant gunfire seemed to be of no concern to those deer. I guess they are like most New Yorkers and have gotten used to a lot of noise. Notice that I said "noise" and not "gunshots". The latter would have been those deer's great grandparents. Below is a list and links to some nature trips and events around NYC for the weekend of February 14-15, 2009. Meet at the Jamaica Bay Wildlife Refuge for an easy hike around the West Pond, gardens, and upland woods. 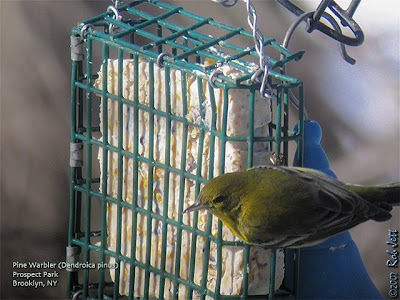 Learn how plants and animals adapt to winter and look for wintering birds there. Limited to 25. For information and reservations, call (718) 318-4340. My friend Steve Nanz will be speaking at the Queens County Bird Club at the Environmental Center in Alley Pond on Wednesday, Feb 18. The meeting starts at 8:00PM. His presentation will be on the wildlife in Queens with the first half focusing on the Ridgewood Reservoir. Directions can be found here. Steve is a recreational photographer who takes some really fantastic photos of everything from eagles to micro-moths. Last week I spent some time biking around Brooklyn. When pedaling up McDonald Avenue towards Prospect Park West I spotted a large bird wing in the road. I had just read a report on the NYSBirds list about two dead owls found on the road in Cedar Beach, so was concerned what I found might be the remains of an owl. McDonald Avenue is a pretty busy road just outside the fence that surrounds Green-Wood Cemetery. My first thought was, "Oh no, one of our Brooklyn owls had been killed." I couldn't find any other remains of the dead bird. It could have been under a parked car and it was too cold for me to start crawling around on the ground. I'm not usually in the habit of collecting roadkill, but the unusually large wing seemed worth the stop. When I got home I flipped through the pages of several field guides and ruled out any owl species. After a sigh of relief, I put it aside, but kept thinking that it looked familiar. Over lunch it hit me; juvenile Black-crowned Night-Heron. I sent a note with a photo of the specimen to a few people I know who have worked closely with birds. 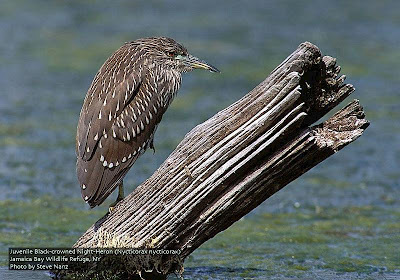 Shai Mitra agreed with the night-heron identification and sent a link to the University of Puget Sound online bird wing database. The ill-fated bird was probably flying back and forth between the small ponds at Green-Wood Cemetery and the lake in Prospect Park when he flew too close to the road. With the subject of bird/aircraft strikes prominent in the news and annual efforts to prevent migrating birds from striking the glass windows of office buildings, it seems that motor vehicle strikes have gone unrecognized as a problem. Sadly, it drives home the point that human technologies have created a tangled gauntlet for birds every day. Apparently, it is not that unusual for owls to be killed by cars along the roadway at Jones Beach. I read somewhere that a contributing factor for the extirpation of screech owls in urban parks, such as Central Park, is paved roads. Screech Owls learn that they can perch at the side of a road, patiently wait for any prey crossing the pavement, then pounce. Unfortunately, if a car is approaching, they don't seem to have the sense to move out of the way. 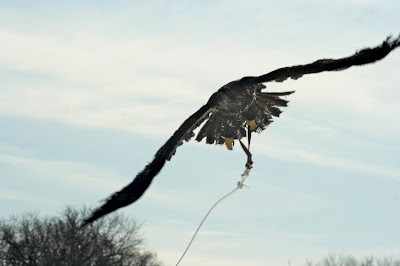 I just received a follow-up report and photos from Bobby regarding the juvenile Bald Eagle that he rescued in December. In his email, he mentions the word "creance". It's a new one for me too, so I added a link to the definition. I just wanted to forward some pictures taken of a recent trip to the field creance flying the eagle. We were dissappointed with the lack of flight ability at this time. Unfortunately, since the feather condition has deteriorated instead of improving, after discussing the case with DEC and other eagle experienced rehabbers it was decided the best course of action for this case is to hold the bird till it molts. That won't be until this summer at least. A first year bird molts later and not necessarily complelely as adults do. A broken feather sample was sent to the DEC pathology lab and they were unable to determine what the substance is or come up with a solvent to remove it. The feathers now feel like hairspray was applied and anymore washing is only drying them and causing them to become brittle. 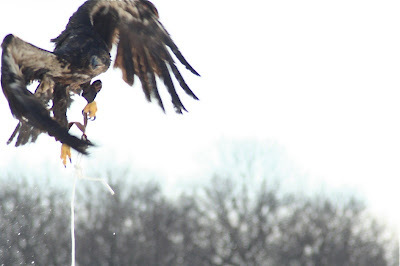 We followed the TriState Bird Rescue protocol for oil soaked birds with no success. He's only partially flighted at this time . 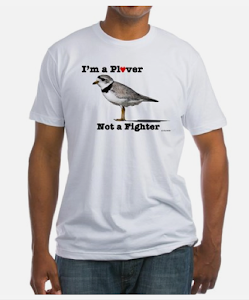 We know for sure the feather situation is a definite problem, but aren't sure if there's any others issues besides. We had hoped to get him back out as soon as possible as it is beneficial for Bald Eagle juveniles to be released in the winter, contrary to other bird release timeframes, as they are social at this time of the year and learn from being released where other, older birds are wintering. Sorry to report that won't be the case here. Anyway, we plan to continue exercising him for physical and psychological reasons until the new feathers start to grow in and then we will be forced to let him rest as to not damage any new growth. Until they are developed enough then we will start flying him again for pre-release conditioning. Thank you for your support and your followers support as well. Over the past several weeks I've been tweaking my blog a little and adding some new features. In addition to a few minor color changes to the template, I've added more resources. In the sidebar are menus for maps of birding hotspots around the five boroughs...well, make that four. The Manhattan menu is still a work in progress, but will be finished soon. Most of the maps include tags above the noteworthy areas within that birding spot. I'll eventually have all the maps annotated. Long Island is also a work in progress. 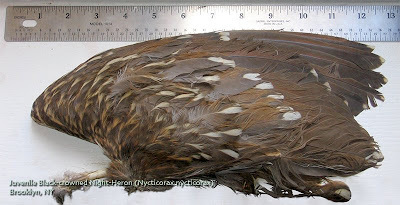 Note that I've also re-added a menu to Phil Jeffrey's NYC Birds Identification Wiki. I'm sure he'd appreciate any contributions to the bird descriptions. Monday mornings I will add a list of local birding/nature trips for the coming weekend. I'm trying to cover all the nature organizations within NYC, but am having trouble finding current Staten Island information. Let me know if you have any SI contacts with that data. "The Nature Blog Network is the nexus for the nature blog community, the portal through which readers and publishers alike can locate the very best nature blogs on the net." 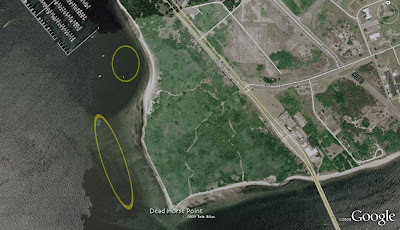 Next Saturday I'll be leading a birding trip to Pelham Bay Park. Below is more information, plus a schedule of field trips around the city for the weekend of February 7-8. You don’t have to travel to Alaska to see our country’s emblem, the American Bald Eagle. 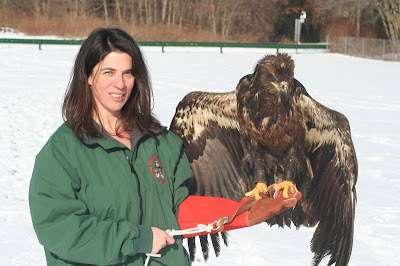 As a result of one of the most successful reintroduction programs on record, many eagles now soar over the beautiful Hudson Valley. Travel with us in a private coach to view this spectacular raptor, as well as possibly spot the short-eared owl, long-eared owl and great horned owl . 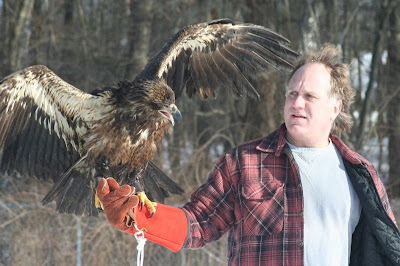 Part of the Hudson River EagleFest at Croton Point. Bring lunch, water, and binoculars. Limited to 35. Eagles, eagles, eagles!. This all-day trip up the lower Hudson Valley starts at the Croton Railroad station, moves on to Croton Point Park and other spots good for sighting Bald Eagles, owls, and other winter specialties. Bundle up and bring lunch. Please let Ian know if you are planning to join us. Time: 7:00 a.m. Lower Alley Parking Lot (Winchester Blvd.). For carpooling, 7:40 a.m.- Croton train station. Note: This trip can also be done by public transportation if necessary. Be prepared for extensive walking, and bundle up. The morning only short tour will end at a restaurant to be determined for a social lunch. I like spending as much time outside as possible, well, within reason, anyway. Unless New York is being pummeled by a hurricane or blizzard, I really enjoy exploring the beach in the winter. The southeastern boundary of New York State is made up of an 118 mile long sand spit called Long Island. To be fair, geologically there's a bit more to it than sand, but not much. Protecting the south shore are several long barrier islands. Breezy Point, at Rockaway Inlet, is the western most end. Looking north from this point one can see Coney Island, the Verrazano Bridge and, on a clear day, Manhattan. Traveling east, and passed Shinnecock Inlet, the barrier beaches gradually merge with the mainland, terminating at Montauk Point. During the winter months there's always a lot interesting bird life along the coast. One our way back to Brooklyn we made a quick stop at Floyd Bennett Field. In a small patch of grass near the community gardens we found a flock of Horned Larks. Horned Larks have a funny way of multiplying in front of your eyes. Perhaps it's their compact shape and earth tones, but whenever I think I've counted all the birds in a flock, 20 more appear out of nowhere. In this case, it turned out to be the largest flock of Horned Larks that I've seen in NYC. There were 80 birds on that small patch of vegetation in the center of a concrete parking lot. Saturday morning I bundled up and rode the 3 miles to check on the owl nest. The nest was still occupied, but it was unclear if it was the male or female on the eggs. The bird seemed larger than in my last photos, which could mean it was the female. It was also 12 degrees, so his or her feathers could have just been fluffed up more for warmth. I could have used some of those feathers. The sun was beaming down on the nest over the adult owl's left shoulder. She would periodically turn her face towards the warmth, stare up at the source and close her eyes. I stopped in Prospect Park on my way back home. At the lake, the remaining waterfowl are concentrated in a small opening near the Three Sisters Islands. A trio of Common Mergansers had joined the Canada Goose, Mute Swan, American Black Duck, Mallard, Northern Shoveler and Ruddy Duck. A pair of juvenile Red-tailed Hawks landed in a tree above me and appeared to be scoping out the ducks. One flew down to the edge of the ice, to the remains of a female Mallard. 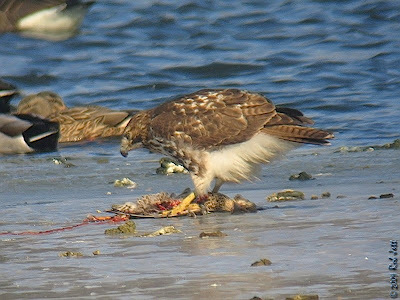 As the large raptor feasted, a noisy flock of geese landed in the water beside her. None of the ducks or geese paid any attention to the hawk and continued paddling around in the lake within striking distance of the bird of prey.